The Junior Ski Patrol is designed to give interested junior skiers the opportunity to learn about skiing and skiing safety, and also give them a fun introduction to community service. The Junior Ski Patrol is an important feature of the Timber Ridge Ski area as it provides a number of important services to the skiing community. The patrol is instrumental in raising awareness in the adult ski community about the minor skiing population, and is essential in recruitment for the National Ski Patrol. 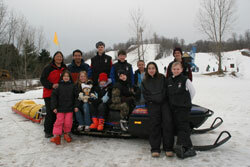 The Junior Ski Patrol is open to any child or grandchild of an active patroller at Timber Ridge between the ages of 8-15.